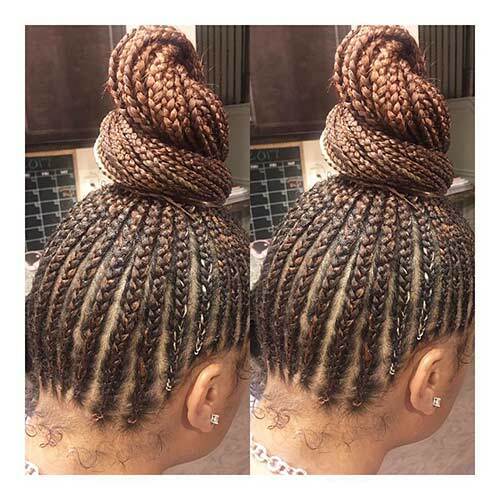 African braided updos are absolutely mesmerizing. 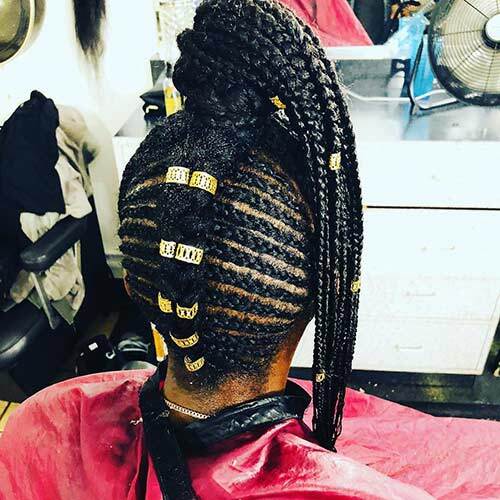 African women have been braiding their hair for centuries now. 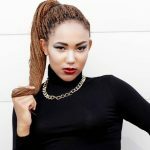 And no matter what style they choose – be it cornrows, feed-ins, Senegalese twists, or the like – they never cease to stun. Besides, braided updos are a great way to beat the heat while looking awesome. Wondering which one to try? Look no further! 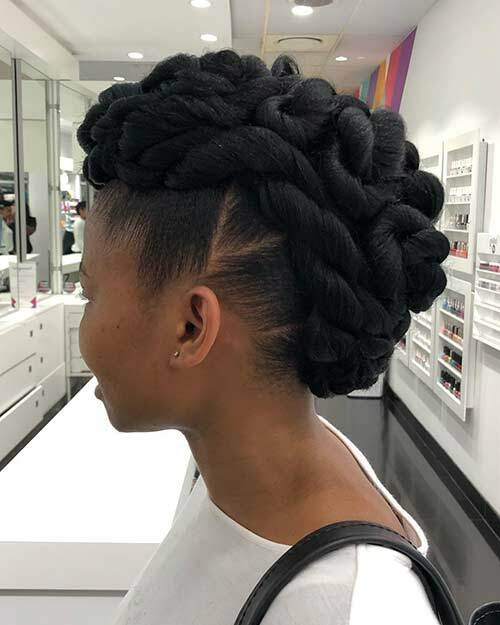 Here are the picks for the best braided updos for African women. This hairstyle is brilliant. 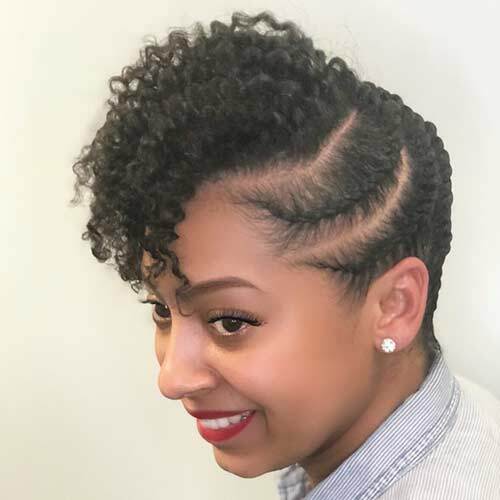 Cornrow your hair from one side to the other from midway to the nape of your neck. Let your curls fall in front like a mohawk. 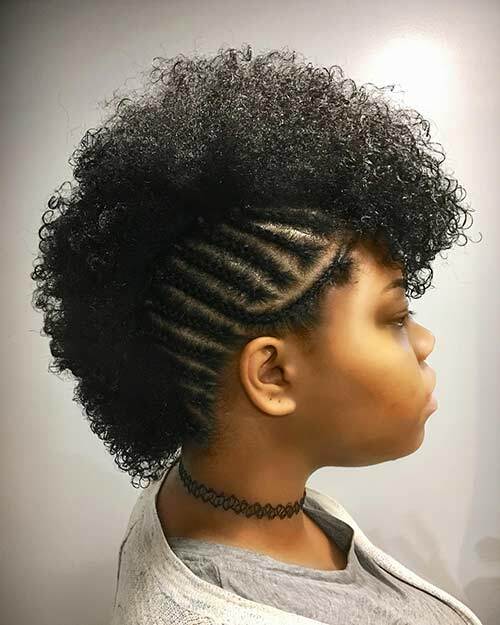 This hairstyle is super cool, isn’t it? Although you will need a professional’s help to get it done, it’ll totally be worth it! This gorgeous cascade braid sure is stunning! Braid your hair from one end to the other continuously while switching the middle section with some loose hair. When you reach the other side of your head and have run out of hair, just tie a loose knot to make it look like a flower. Don’t undermine the power of a top knot. 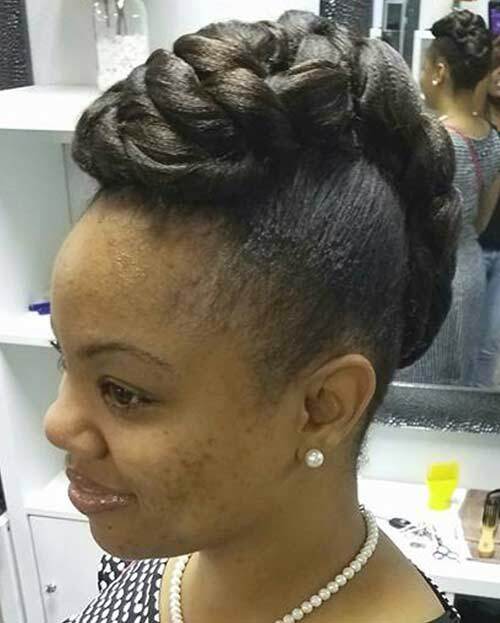 You can play around with the parting to add your own touch to this hairstyle. Instead of using a clip or an elastic band to hold the top knot in place, you can use your own hair to tie it and add an edgy feel to your look. 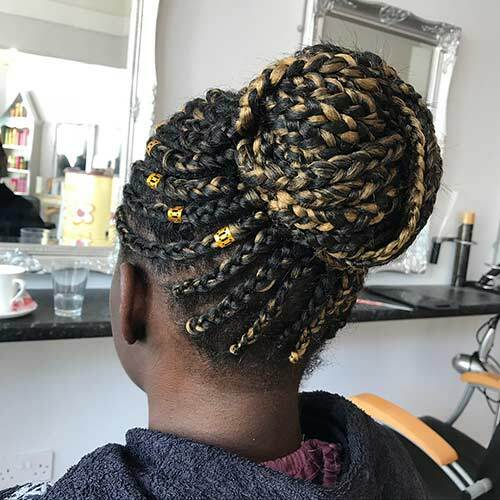 Butterfly braids are one of the easiest braids to do compared to the rest of the African braids. And this particular updo is completely mesmerizing. Butterfly braid your hair on one side and then twirl it into a side bun. You can accessorize the braids with threads or beads to add your own touch. 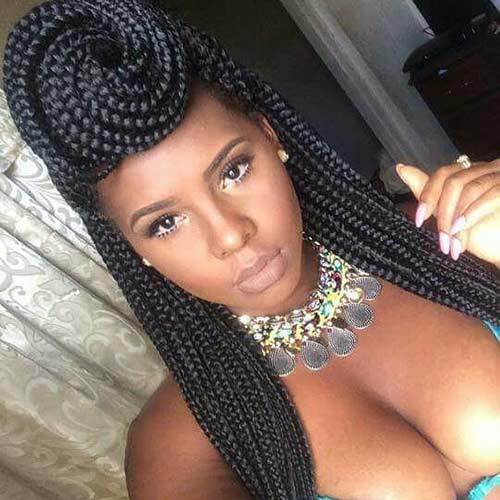 Whoever said braids are tedious did not see this hairstyle! 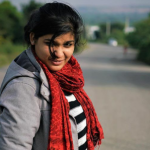 Take the front part of your hair and just give it a twirl. You can hold it in place with some hair pins. This hairstyle is truly angelic. 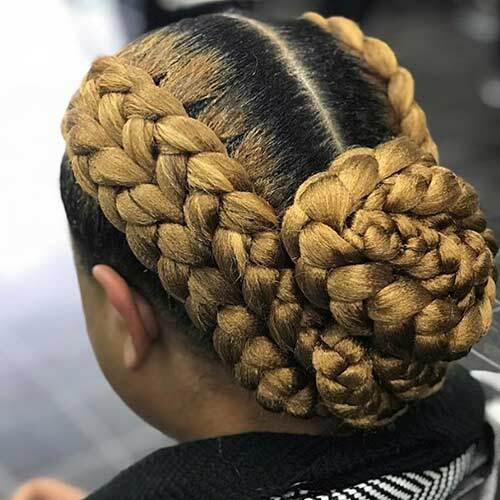 Don’t look at the big braids and wonder how you are ever going to make your hair look that full. 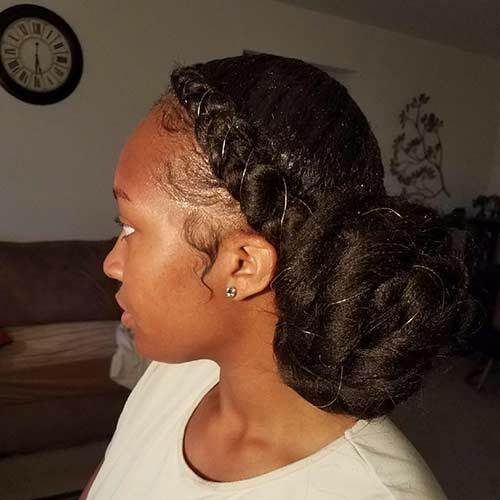 This hairstyle is a blend of your natural hair with extensions. However, if you have long thick hair, you might not need the extensions. Simple and chic. Sport this hairdo for any event – work-related or a party – and you are sure to dazzle. This hairstyle is beautifully intricate. If you have a round face, this hairstyle will add height and make it look elongated. Divide your hair into two halves with a curved parting. Braid one side of your hair, beginning from the hairline and extending it all the way down to your neck. 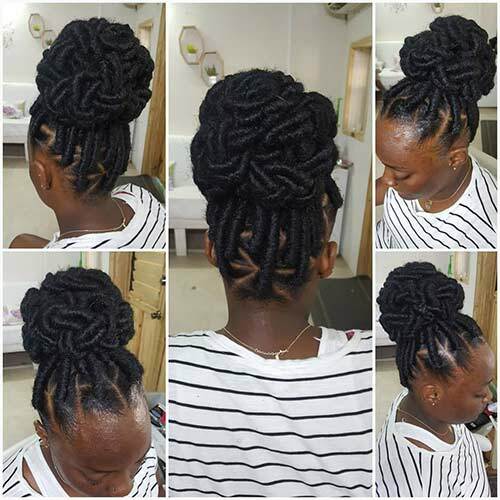 While braiding, keep adding more and more hair to it with each subsequent stitch. Repeat the same on the other side. Twirl the lower half of the braids into a low side bun to finish the look. 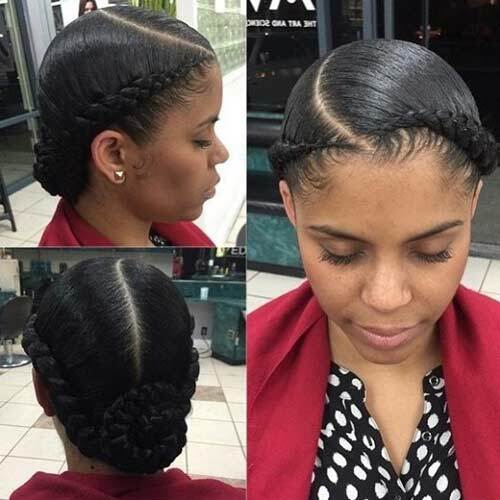 Not only is this hairstyle graceful, but it is also oh-so-simple to do. Styling it with colored extensions and beaded accessories adds even more vibrancy to it. 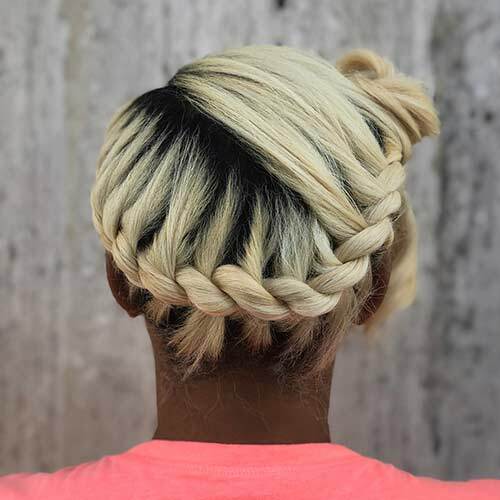 Double braid your hair on each side using the Dutch braid technique to create a luxurious look. Then, wrap the lower half of your hair into a beautiful bun to achieve this iconic look. If you have a round or heart-shaped face, you need to try out this hair look. While the bangs frame your face and make it look slim, the bun adds height and makes it look longer. Here’s a wonderfully playful hair look for you! 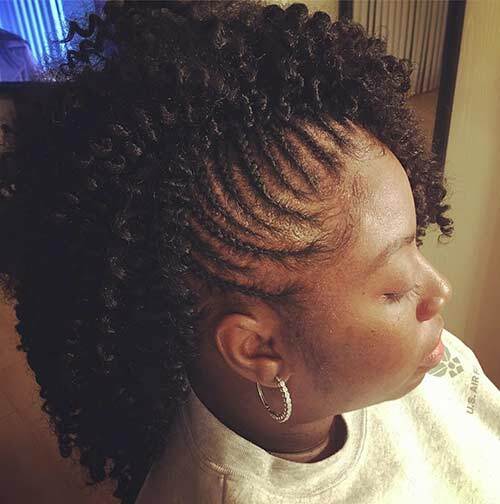 This hairdo is a quirky blend of cornrows and twists woven together in a super high ponytail. Ladies, get ready to be fierce! Show off your inner warrior! 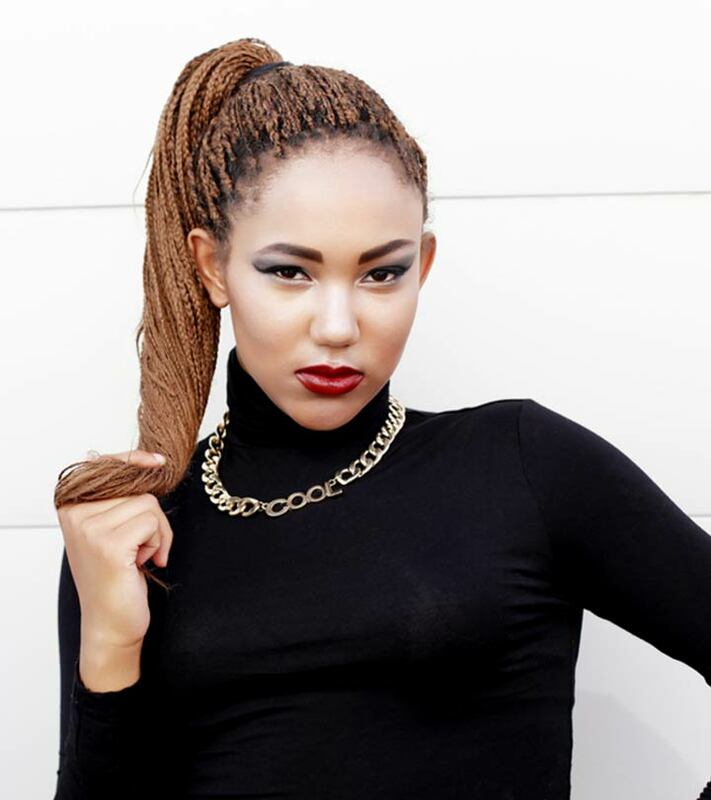 Braid one side of your hair in thin cornrows, leaving the rest curly and free. Apart from being incredible, this hairdo will make your face look longer due to the added height at the top. This hairstyle is the very definition of the word ‘fiery’. 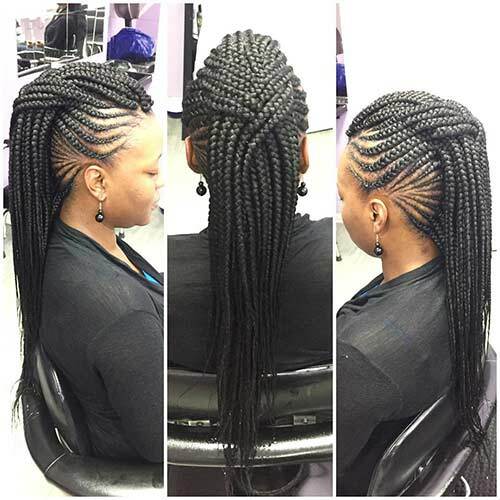 Braid both sides of your hair in cornrows, leaving the center and top sections free. Brush the center hair upwards to make it a mohawk. This hairstyle is a beautiful mess. You’re sure to turn heads with this sophisticated hairdo. All women love wreaths. Take some hair from one side of your head and braid it around to reach the other side – imitating a wreath. Tuck the excess hair within the braid and pin it up. Hairstyle, thou name art elegance! Braid your hair upwards and then bun it up neatly to get this amazing double-decker top knot. 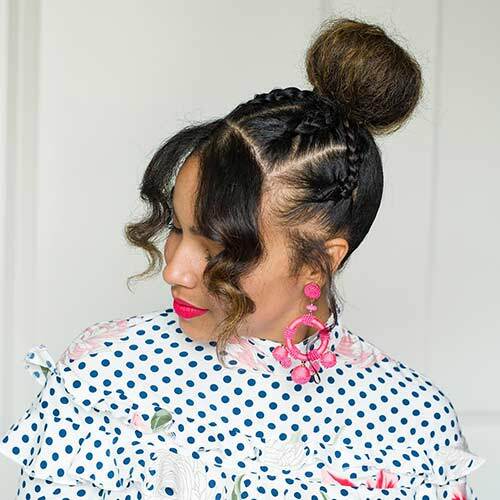 These are our top picks for the best braided updos for black women. 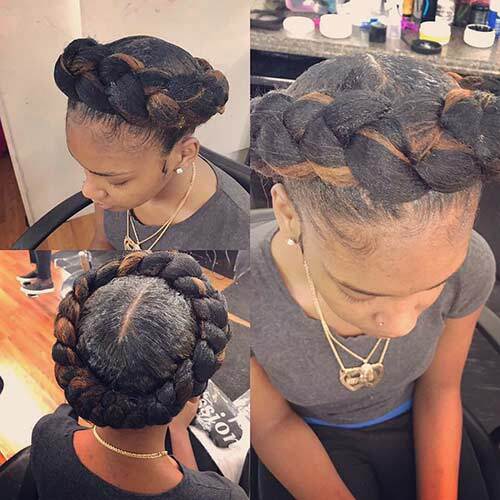 Don’t be afraid to experiment and play around with your hair to get a hairstyle that suits you. 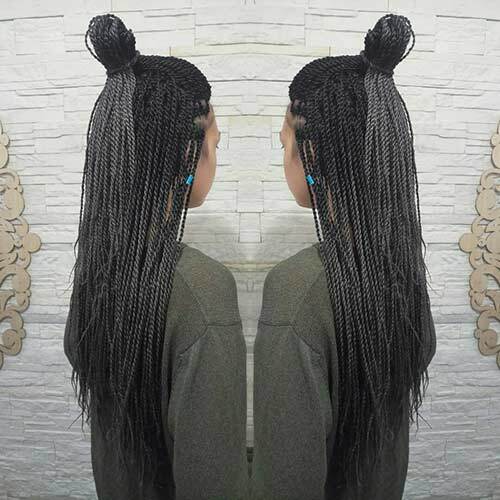 If you have cornrows, twists, tree braids or the like, take good care of your hair if you want them to last for a reasonable amount of time. And accessorize! Accessories can take your hairstyle level up a notch. 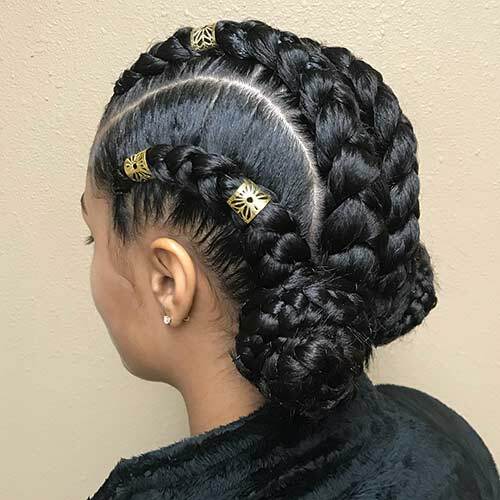 Delve into the world of hair pins, head scarves, headbands, shells, beads, and many more accessories to revamp your braided updos. 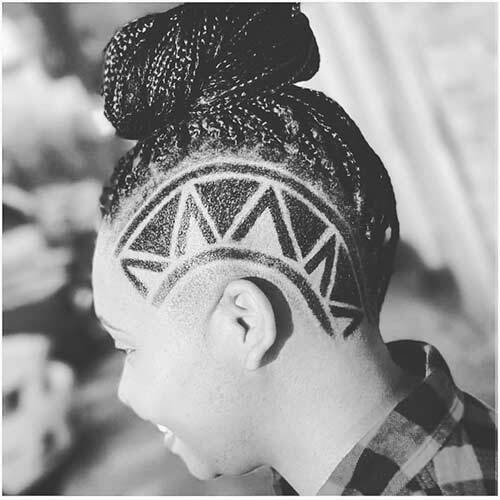 If you like edgy looks, try shaving patterns on your head. They look tremendously cool. There you have it, women! Try out these gorgeous hairstyles and let us know which one you loved the best. Go flaunt those fantastic braids with these updos!